This is the motherlode of Wordpress documentation - everything you want to know is probably here. Still part of the codex, these pages include step-by-step instruction on how to do basic tasks in Wordpress. Basic tutorials on how to do stuff like adding images and links or scheduling posts in Wordpress. Themes from the Wordpress site that are particularly popular. All of the themes uploaded to the Wordpress.org site. Popular themes from around the web that are free. Beautiful Wordpress themes that are not free - often under $100 though! Best practices for successful web design in libraries. Some links to best practices in library web design - both structural and visual - and a link to a page that translates library "jargon" into terms your patrons will understand. Community of practice for libraries using Wordpress as their content management system. Webjunction archived webinar on Visual Design for library sites. Includes best practices for web design and structure. Jargon-less terms for library websites. Both the No alignment and the Align Left will put the image on the left side of the post, the difference between the two is entirely in what happens to the text. For No Alignment, the text is forced down below the image and the area to the right of the image is blank. For Left Alignment the text comes up right to the top of the image and wraps around it (the same thing happens in Right alignment, though the image is against the right side and the text flows along the left side). Center aligned images never have text wrapping around them - the text goes from above to below the image with no text in the same area as the image. This will clear the alignment and will send the text that should be below your post back to where it belongs. Wordpress provides a way for you to easily add stuff to your site. Images, text, code snippets, RSS feeds - if you can access it, you can probably add it to Wordpress via the Widget interface. It's pretty easy to do, too! If it doesn't look right, call or email me! Specific Instructions for adding an image can be found on the NEKLS site at: http://www.nekls.org/nekls-services/technology/database-code-snippets-for-websites/. Those instructions are specifically for adding a Learning Express logo to your site, but will work for any logo. The instructions also show you how to install the Image Widget needed to make adding logos easy. There are two distinct steps in getting a good site counter on your website. The first step is to sign up for Google Analytics. After you have signed up and gotten your tracking code, you then need to install two different Wordpress plugins to get both the backend tracking set up and a pretty report for your Dashboard area of your Wordpress site. This is a sort of long and involved process, but it's not particularly hard - just follow the directions and you will have a web site visitor tracking system in place. To get a Google Analytics account, you must first have a Gmail account. Most of you do, but if you don't or if you aren't sure, contact Robin to help you get one set up (or go to Gmail.com, click on Sign Up and follow the directions to create a free account yourself). Click on Install Now for the Google Analyticator plugin, then use your back button to do the same for the Google Analytics for Wordpress Plugin. You will be asked to sign into your Google Account (the one that you used to create the Google Analytics account in the first set of steps) and give permission for Wordpress to access that account. Enable the Analytics code and make sure that your Google Analytics Name is showing up, then click on Save Changes on the bottom of the page to enable that plugin. 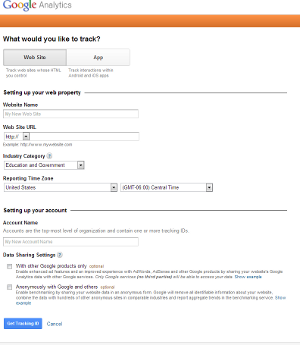 Click Update Google Analytics Settings and wait 24 hours for the first reports to begin to show up on your site's Dashboard.